I like to make new years resolutions that I know I will be able to keep. I am not one of these people that sets goals like loose weight, eat healthier, get fit etc. I like to be a bit more realistic and if I'm honest with you I probably won't do any of these things so I am sticking with a the same theme as last year, which may I add, I kept all of them, how chuffed am I! So here are my resolutions for 2012. It is about time I learnt how to cook. A proper meal, not a microwave meal or beans and scrambled egg on toast. I have never really wanted to learn before and so have never paid much attention, but now I'm ready, it is time and I want to learn. Wish me or should I say my teacher (mum) luck ha ha. I am hoping this book that James' mum bought me for Christmas will come in handy. I kind of fell off the band wagon with my crafting last year, I want to do more crafts at home. I love working with textiles and now with a new sewing machine courtesy of my Nan I hope to be able to do that. So there you have it, my goals for 2012. There is still time to enter into my swap if you haven't already done so. 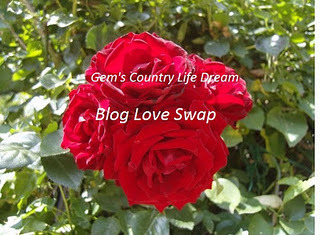 On the topic of swaps the wonderful Julie and Pretty Little Jewels is also hosting her very first swap. It would be great if you could join in. 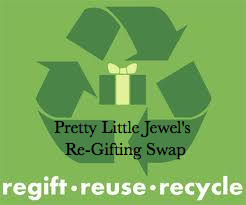 She is hosting a recycling of gifts swap. I have never heard of a swap like this before and I must say I really like it. It is a great thrifty idea with a creative spin. to find out more about it click onto her post here, I know she would be happy to have you. Thanks for reading today. I'd love to hear of any resolutions or goals you have set for yourself. And if you have, how likely do you think you will stick with it? I love your resolutions and the look of that book..I bet it has yummy stuff inside. I can't wait to see some gino decampo recipes on your blog soon lol. Perfect new year resolutions! Attainable but not too demanding! I hope they all go well! i love your list...especially 'have lots of fun'! i may add that to my list. one of mine is learn to quilt, hope i do!